What would the Auckland skyline be without the Sky Tower? Well, there is actually an interesting piece from The New Zealand Herald allowing you to scroll over an interactive photo to look at Auckland’s skyline before and after the Sky Tower has been opened in 1997. But during the past 15 years it became hard to imagine New Zealand’s biggest town without its lanky landmark, which makes the skyline so much more interesting for photographers. Photo forums are filled with the question where to get the best view over Auckland and which locations to visit for the best skyline pictures including the Sky Tower. I got curious myself. So I went out and explored some spots surrounding the city’s CBD. Here are my favourite skyline photos and Sky Tower facts (click on a photo to view it in large). Some of these photo locations are actually worth being photographed themselves from the Sky Tower. At 220m above ground you can get a 360 degree view right across Auckland. Have a look at how impressive the Spaghetti Junction looks like from here. You can also try capturing the opening / closing Wynyard Crossing when ships are leaving the harbour or coming back from the sea. I visited two more locations: Shelly Beach Road and Mount Eden. Both are good spots to have a view over Auckland City. Check out the two panoramas below to get an idea of the view. However, you need a very good zoom lens for both because the skyline is rather far away. Alternatively it could be worth trying a fish eye on Shelly Beach Road as it might allow you to capture the Sky Tower and the Harbour Bridge in one photo. All photos for this post have been taken with my 17-70mm lens. 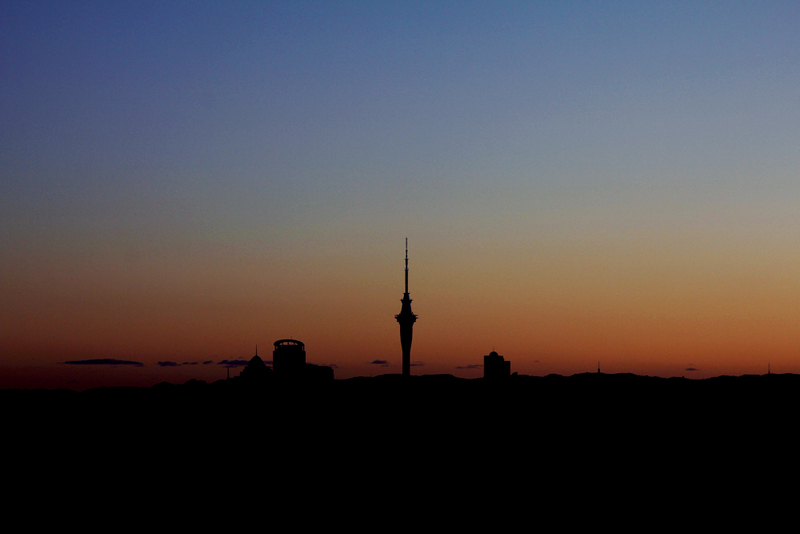 I would be happy to test more Auckland skyline photo locations if you share them with me. This entry was posted in blog, new zealand, urban and tagged auckland, blog, light, long exposure, new zealand, night, urban. Bookmark the permalink. ooo, like the Shelly Beach Road Bridge photo! Excellent!